Spicewood at Cedar Ridge is a low-maintenance community in Broken Arrow, Oklahoma. The neighborhood includes 47 attached homes, some of which are available on a resale basis. Homeowners enjoy a low-maintenance lifestyle with a homeowners’ association (HOA) that takes care of exterior home maintenance. A clubhouse is available for residents to organize events and Tulsa is just a 25-minute drive away. Residents of Spicewood at Cedar Ridge have access to a clubhouse with a meeting room for holding social events and an exercise room for staying fit. Outside, a patio provides a place to relax with neighbors. Walking paths throughout the community connect homes and are great for taking a stroll. Benchmark Construction of Tulsa LLC started building Spicewood at Cedar Ridge in 2008 and finished in 2016 with 47 homes. These attached homes range in size from 1,472 to 4,667 square feet and feature two to five bedrooms, one to three-and-a-half bathrooms, and two to four-car garages. Popular features include stainless steel appliances, granite countertops, and hardwood flooring. The HOA makes life easy for residents of this active adult community. Lawn care, snow removal, and trash pickup is paid for by a monthly fee as well as landscaping for common areas. With exterior home maintenance taken care of, homeowners have more time for playing poker or meeting with neighbors for breakfast. 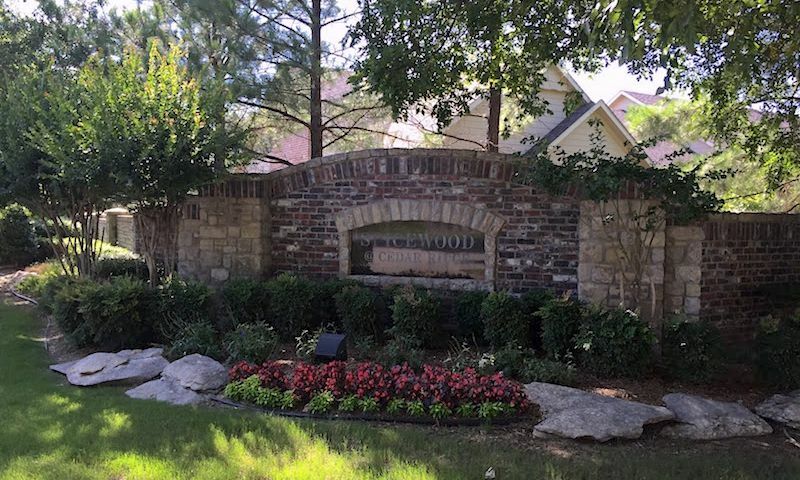 Spicewood at Cedar Ridge is conveniently located near plenty of amenities, shopping destinations, and entertainment. The Cedar Ridge Country Club includes an 18-hole golf course, five tennis courts, and a huge pool with water slides and fountains. Woodland Hills Mall is just twelve minutes away and includes a JCPenney, Macy’s, Barnes & Noble, Old Navy, and Walmart Supercenter. Highway 64 is easily accessible from the community and takes residents to Tulsa in only 25 minutes. The Tulsa International Airport is even closer, allowing residents to take a trip whenever they like. With low-maintenance living and a great location, Spicewood at Cedar Ridge provides homeowners with a carefree lifestyle and excellent amenities. Check back soon for more information on the lifestyle in Spicewood at Cedar Ridge. 55places.com is not affiliated with the developer(s) or homeowners association of Spicewood at Cedar Ridge. The information you submit is distributed to a 55places.com Partner Agent, who is a licensed real estate agent. The information regarding Spicewood at Cedar Ridge has not been verified or approved by the developer or homeowners association. Please verify all information prior to purchasing. 55places.com is not responsible for any errors regarding the information displayed on this website.